We recently heard about a project called Beatles Global Relay. According to the email we received from Jo Gamble of Creative Concern, "This will be the first time the world's talented Beatles tribute acts have joined forces to make a single tribute spanning the continents!" The project celebrates the anniversary of the release of "From Me To You" by inviting bands from all over the world to submit their own versions of the song, which will be used to create a composite video. It was fascinating, but we had no way of knowing whether any effort recording the song and making a video would result in our being included in the global compilation video. Still, our fearless leader Dennis saw the opportunity, and found that we already had some good footage of us playing the song from a couple of concerts over the last couple of years. 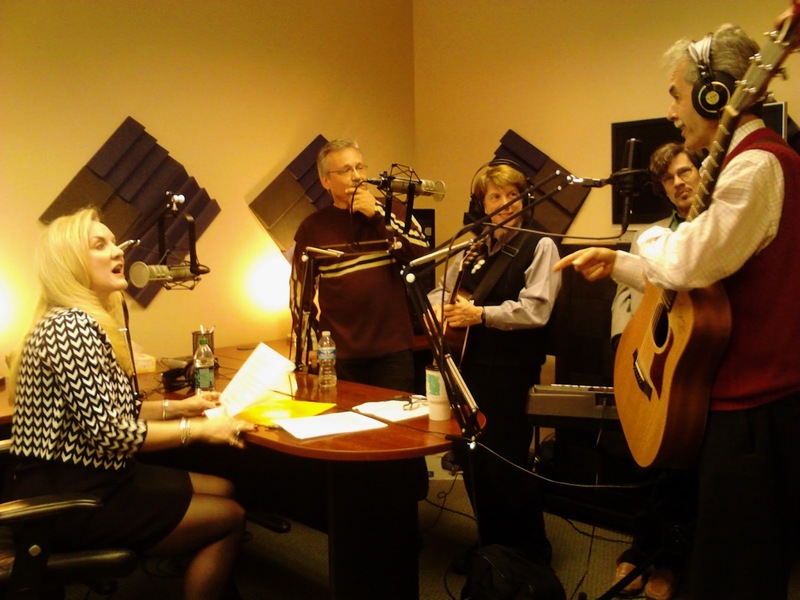 What we needed to do was to make a quality audio recording of the song, to go with the video. To make sure our performance would match, David did his usual high-tech Sherlock Holmes work by assigning a tempo click to our stage version, which was pretty consistent, but not exact. In our study of Beatles songs, aided by David's relentless search for the musical truth, we've found that their tempos would fluctuate. Not a lot, but enough to reveal that they were human, and got their groove by playing together. It never sounds wrong, because they worked so well as a unit. I suspect that's part of their magic, and what made them so irresistible. We had to squeeze various commitments out of small increments of available time, but we put it together over a week or so, in successive parts. We did vocals at Dennis's studio. David and I harmonized the double lead, and in studying the record again, discovered a few more notes we weren't doing correctly. Nathan played McCartney's bass part on his Hofner, and Dennis put his chromatic harmonica to work. For guitars, I attempted to duplicate John's driving rhythm on my Epiphone, and some of George's lead parts. Beatles songs hold up really well. This particular one is less than two minutes long. (The time is 1:58) It has a solo, lots of harmony, some relatively sophisticated chords, and plenty of energy. It's pure Beatles, a great example of their early period magic. After our tracks were recorded, we polished it off with our favorite mixing engineer, Gary Dales. It turned out to be Gary working in Dennis's studio without Dennis there, because the deadline was approaching, and Dennis was already committed to being in Florida this week. Here's how it sounds with Gary's magic applied. The video is basically two different live versions combined. One was at the Alhambra Theater in Hopkinsville KY, and the other was at the Renaissance Center in Dickson TN. The Kentucky concert was shot by a videographer, so there are several good camera angles. The Renaissance concert includes a few audience shots, which may be from some other song, but it's still people listening to us, and having a good time. Our old friend Vince Pinkerton, who also did our "Paul" and "Betty" videos, put the video together for us. It opens with a shot of us sitting on the steps in Dennis's house, greeting the camera - which was held by Dennis's son Ryan. Click here http://youtu.be/l-IG7zoIUhM to see the video, although this version doesn't contain the finished audio. If all goes well, we'll be included in a global tribute to the song. The date the final film will be released is April 11, the 50th anniversary of the release of the original record. It's great to be part of the excitement. Congratulations to all the other bands, and Liverpool, and everyone who's been affected by the Beatles' music around the world. It's March 21, and the trees are starting to blossom around Nashville. 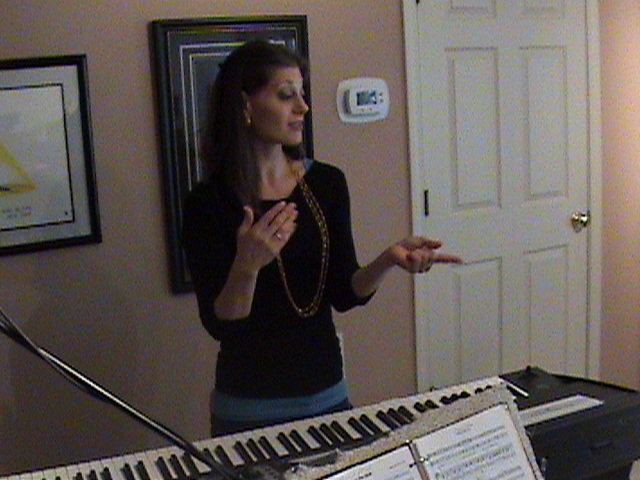 Today, we had a vocal lesson with Emily Speck. This is an experience that WannaBeatle David has been advocating enthusiastically for several months. He keeps telling us we could be better. David is certainly the best singer in the group, and has a teacher's natural ability to explain - although he knows that a more experienced vocal coach like Emily would be able to explain it better to the rest of us. David says if we only put in the time to learn a few basics and apply them, it would make a huge difference. So today's rehearsal was the time to move ahead with that goal, with an hour with Emily. Emily is married to Jake Speck, the managing director of Studio Tenn, (www.studiotenn.com) the new local theater company that is making quite a noise. WannaBeatle Nathan has been very involved with Studio Tenn, having played on many of their productions. He played for, and even wrote original music for their original staging of "A Christmas Carol," which ran two weeks at the Franklin Theater in December. As an indication of how the company is growing, that show is moving to TPAC for this year. Emily showed up with a water bottle with the sleek Studio Tenn logo on it. She showed us a photo of their 2 year old twin boys. And after some brief catching up on how good the Belmont students are in Les Miz, we got down to work. Emily gave us a CD with about 20 exercises on it. David is making copies so we each can have one, and can warm up with it in our cars, every day, but especially as we drive to gigs. She ran us through some exercises, and gave us essential tips on protecting the voice. Caffeine is not good for the voice. Cough drops with menthol are not good - the menthol dries out the vocal muscles. Water is good. She gave us the fundamentals of breathing, how the diaphragm supports the breath, and how the ribs should expand as we inhale. Emily Speck, at Dennis's studio, giving us vocal pointers. On one of the exercises, Emily spoke about the pharynx, which is located above the larynx. She spoke of the sensation right before a yawn, or the way your face feels when you open the freezer door and get a blast of cold air. This was her way to show us what the pharynx does. And I got it. I could feel that space - for the first time. And I could see (actually feel, and hear) how that space affects notes I sing - making higher notes more clear and full and easy. David was hearing it too, and glad to hear the difference. We had one of several fist bumps of the day. We tried certain songs that have presented problems for us. "Yes It Is" was one. Emily made suggestions about Dennis's vowel sounds, and immediately we could all hear a difference. We sang a bit of "Michelle," where David, Nathan and I do the sweet background parts, as Dennis sings lead. Emily helped us find a warmer "ooo" sound, and even though Dennis already sounds good on the song, he found a new level of confidence and warmth that came out on the bridge. We are fans of Emily! And when we get to work on the exercises she's given us, we'll probably become bigger fans of the WannaBeatles, and hope others will join us. 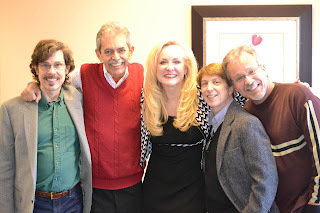 Thursday the WannaBeatles were interviewed for a truck drivers audio magazine. Strange? Well, it was new to us. But the format was pretty familiar and the experience was tons of fun. Here's how it happened. Darcy Young, the hostess of this particular show, contacted us to participate. We found a time to gather at their studio in Cool Springs, for 45 minutes of interview, plus live acoustic performances, and a few of our recordings thrown in. It was similar to a live radio interview. We've done a few of those, on two local stations, Hippie Radio 94.5 and The Rock 105.9. We enjoy the casual atmosphere, and singing and playing live unplugged versions of our songs. But this was not for radio. This was for a series of CDs which are distributed to truck drivers for them to listen to while they're driving. The CDs are not sold to the drivers, but included in packages that the transportation companies distribute to their drivers. So our interview with Darcy was going to be heard by truck drivers playing the CDs in their rigs. The company that produces the CDs is called S and E, (named for Smith and Edwards, the two partners whom we met there - Greg and David). It's suite of well-equipped offices located in the calm semi-industrial part of Cool Springs. Darcy greeted us there, and led us back to the studio, which resembles a radio studio, with a couple of classic microphones on large suspended arms. There was another microphone for Darcy, and a table where she and her guests sit to talk. We brought an acoustic guitar and a small keyboard, but everything was captured on the two microphones. Greg Smith was our engineer, located in the room next door. Darcy would be talking to him on her microphone, taking suggestions on which one of us should get closer to the microphone. We sang a bit of our four part harmony on "I'll Be Back," which is our usual sound check, and Greg said it sounded fine. He used the stereo capability to pan us left and right, between the two microphones, which is something that wouldn't have happened on a radio interview. And unlike a radio interview, we could go back and repair mistakes. Darcy had just listened to our Grammy nominated "Fab Fan Memories" CD, which gave us a chance to talk about the stories on that album. We mentioned having Louise Harrison, George's sister, as our host on the CD. That reminded us of our song "Louise," which will be on our new CD. We joked around and laughed a lot. Darcy really knows how to make an interview fun. When we started singing "Drive My Car," we wound up spontaneously replacing the chorus with "Baby you can drive my rig," which made us scramble for another line that would rhyme. I think I sang "Yes I'm gonna be a pig," which rhymes, but hardly makes sense. Everybody else was singing something else. It was after the session when Dennis said we should have sung "Even though it's rather big," or something like that for the second line of the chorus. I knew Dennis could come up with some great alternate lyrics for a trucker's version of a Beatles song, and thought it would be a great addition to another CD, but he didn't' think it would be a good use of our time and energy. We gathered in their lobby for a few photos, which Darcy said she's post on Facebook. After a very enjoyable time at S and E studios, we left, to go to our usual Thursday rehearsal. I sure hope the truck drivers who listen to that CD enjoy listening to it as much as we enjoyed making it. The WannaBeatles started by playing Beatles songs we already knew, but it didn't take long for us to start rehearsing, and learning more - about Beatles songs we thought we knew, and others we didn't know. It was WannaBeatle David who first suggested it, and he's the natural man for the job. He's got a master's degree in music, and directs a choir, and teaches students on a daily basis, on drums, guitar, and bass. But what really sets him apart is a ferocious appetite for details. As we gather in rehearsal to listen to a Beatles song, David will apply his Sherlock Holmes detection methods, transferring the audio to a software program that allows him to slow down the playback, separate the stereo channels, replay sections endlessly, and analyze to his heart's obsessive content. He will hear tiny overtones that sound like an extra background vocal part, or a higher guitar part, or a flute, or something no one had suspected was there. What makes the research so challenging, and rewarding, is the fact that the Beatles themselves used the studio in a very creative way. So there's plenty of research to do. Diving into their tracks makes us feel like archeologists uncovering the equivalent of New York, London, Paris, Rome, Rio de Janiero, Tokyo, Moscow and New Delhi all at once. The Beatles started as a performing band, and their early songs were written to sound great in that format - guitars, bass and drums. The instrumental parts fit into the vocal parts to make an irresistible whole. That's part of their genius - combining their songwriting ideas with their own musical abilities. That's also what made their impact so great: they made being a "band" such an amazing reality. Nowadays we toss around the term as if it's been a reality forever, but before the Beatles, being a "band" was not such a cool or appealing thing. But as their popularity became a burden, as screaming fans made it impossible for them to hear themselves, they finally stopped playing live performances. Especially after Sgt. Pepper, they put their energy into writing and recording in the studio, using the emerging multi-track technology to experiment with additional instruments. They produced records that were never intended to be performed live. Each song was unique. Many of them benefitted from George Martin's arranging skill, like the driving strings he added to "Eleanor Rigby." 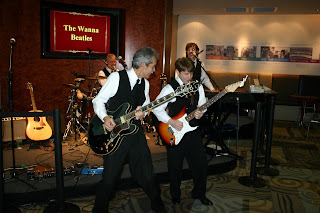 The WannaBeatles, in looking at the musical challenge, had considered the advantage of adding a bass player, but decided that remaining a four piece group was worth whatever sacrifices we would have to make. And so we look for ways to reproduce the elaborate orchestral sounds from the more complex Beatles songs with whatever resources we have as a four piece band. David is also a fearless explorer of technology. He has guided Dennis and me through upgrades in our guitar effects. Dennis uses a MIDI guitar, which allows him to play a variety of sounds in addition to his electric guitar. He uses it to play sitar on "Norweigian Wood" and "Lucy In The Sky," and French horn on "Sgt. Pepper." I've expanded by playing horns in addition to guitar, and using a pedal that reproduces hundreds of different amps and effects. On a song like "Got To Get You Into My Life," we needed to simulate a horn section, so I brushed up my old cornet chops from elementary school to bring a real instrument into our mix of sampled sounds. We use Nathan's keyboard for trumpets, Dennis's MIDI guitar for more trumpets and some saxophones, and then my cornet as the touch of a real horn blending into that section. Then there's the guitar solo at the end of the song - which I play, a few seconds after putting down the cornet, leaving the other two "horn players" to cover the parts while I'm busy picking up another instrument. This is typical WannaBeatles business - turning ourselves into pretzels to make the music happen. Nathan is another case unto himself, programming his keyboard for special sounds to fit each song. Sometimes he'll program four or five different sounds on different parts of his keyboard, or switching from one bank of sounds to another, just to accommodate a necessary sound. Sometimes he'll even program a special sound, like a bass note bending, and put it onto one key, to be used only once. It's a very dedicated and complicated process, but the technology is available to bring a huge variety of sounds into the performance, and we give it all we've got. One song that has been a big challenge is "All You Need Is Love." Nathan is especially burdened, since he's playing all the bass parts with his left hand, then playing harpsichord and piano with is right hand, and still has to find space on his keyboard, and the fingers on his right hand to play elaborate string parts that conclude the solo section and fill the ending. Dennis fills in with extra string parts, including harmonies, on his MIDI guitar, but this must be executed while he's singing lead. I'm switching between guitar and cornet, but also adding tenor sax to the mix, which, unlike cornet, means I must take off the guitar to play it. For me, "All You Need Is Love" means starting on cornet, switching to guitar, picking up the cornet, putting it down in time to play the guitar solo, then taking off the guitar to pick up the sax, then picking up the cornet again for the Bach quotation at the end, and then sax again for "In The Mood." In other words, for me there are about thirty seconds of no sounds but just switching instruments during that song. But it's a sacrifice we're willing to make! Meanwhile, David has added a keyboard (to his left) and an electronic pad of sampled sounds (to his right) to his drum setup. He's also found a way to add a tambourine to his high hat, and a shaker to his drumstick. He's even got a drumstick with a shaker attached that he can put into his shoe, to play the shaker while both his hands are busy playing the drums. These innovations are the result of David listening carefully to the Beatles records and discovering that they had overdubbed various percussion parts. He also loves finding solutions to problems, and leads the charge on getting us acquainted with new technology. One thing I had noticed in "All You Need Is Love" is the sound of a percussive hit, sort of like a drummer using his stick on the rim of the snare drum, hitting some upbeats during the first verse. David listened and heard it but said it didn't sound like a stick on the rim. Finally, this week, David had a breakthrough. He sent us an email message with the video - actually several videos - that solved the mystery. Both Bryan and I are wrong. It isn't a drum or chunking guitar that are making those woodblock type sounds. They are playing it on the Cellos shell or a string instrument shell. Dig the straight 8ths on the harpisichord and the 3 aganist 2 further on. Brass Isolated and guitar solo and some strings! You can also hear all the layered tambourines and snare part in background! You can hear it clearly in the chorus and guitar solo! Check how they go into straight 8ths in the tambourine during the 16note string run at the end of guitar solo. Crazy cool! A MILLION LAYERS FOR THE ORCHESTRA TO PLAY! YOU CAN USE MULTIPLE PERCUSSIONISTS ON TAMBOURINES AND CASTANETS AND SUCH! YOU CAN HAVE A FIELD DAY WITH PERCUSSION ON THIS. That's David's message, and it's pure David. He loves digging deep, and uncovering the musical details. It's a big part of what gives the WannaBeatles an edge. Sometimes we feel like we're not measuring up to the high standards we set for ourselves, but we keep trying, and getting better. Next time you see the WannaBeatles play, notice the extra gear set up around David. He's not just a the energetic drummer sitting there singing all those high parts, although that's great. He's also a technician, triggering samples like the bell sounds on "Penny Lane," and playing keyboard with his left hand, to add extra string parts to "Here Comes The Sun." On some shows, he comes out from behind the drums to play guitar on "Norweigian Wood." He also comes up with great bass and keyboard parts. The intro to our song "Oh Betty!" contains an organ lick that David came up with and played. In short, we have a tremendous irreplaceable asset in David Toledo. No other band can claim him. He's ours, and we love him. Even if our lack of perfection makes him feel like we don't. One great thing about the internet is its ability to document and spread the word about inspiring events. A delightful example would be those videos that start in ordinary public spaces, like a train station or a shopping mall, then one person begins to sing, or play a musical instrument. Gradually more "bystanders" join in, and it becomes apparent that an entire professional performance has been planned, as a surprise to all the others there. It's a beautiful thing to see, a group of everyday commuters responding to an unexpected performance of beautiful music during their day. The performers clearly enjoy the reactions, knowing that the response is totally authentic. They see smiles, looks of disbelief, curiosity, expressions of joy - a sense of being suddenly released from the humdrum routine, and discovering the possibilities of creative freedom. Because it's not a scheduled or paid performance (at least not paid via ticket sales) it's a radical business model. It's not really a business model at all. The performers' love for what they do is built into the premise. That's part of its charm. It's a living example of a "random act of beauty," and in its own way a profoundly revolutionary act. We've enjoyed several of these videos over the last few years. We've noticed that most of them originate in Europe, and often use classical music or well known hymns. Or a show tune. Here's one from 2009, which uses Julie Andrews singing "Do Re Mi" as the soundtrack to a huge dance performed in the Antwerp train station. It's been viewed over 10 million times. Just this week, we discovered a name for the phenomenon: flash mob. And we found another example, this time with a Beatles song, sung in an unemployment office in Madrid. The song is "Here Comes The Sun," one of those dispatches of optimism that songwriters can't help writing every now and then. This one is from George Harrison, the usually overlooked songwriter among the Beatles, who, by the time of Abbey Road, had risen to his place as an equal to the other fine writers in the group. The video includes the lyrics translated into Spanish, with "Little darlin'" coming out as "carino." There are no drums or guitars - only voices and orchestral instruments. They stumble a little bit at the tricky 5/4 bars in the middle, but no one complains. The point is not perfection - it's the invitation to a new level of creative enjoyment, and, like love, it never fails. The WannaBeatles would love to be part of a flash mob. Dennis, our fearless leader, saw our airport show today as an opportunity to team up with some willing performers. He contacted a dance coach at Vanderbilt who had done similar things with her dance class, and the discussion went from possible to plausible. The problem was that today was the beginning of spring break, which meant her students would be unavailable. So we may have missed this chance, but we want everyone to know where our heart is. We love the idea of music erupting unexpectedly in public places, and giving everyone a good time. In certain ways,the flash mob phenomenon recaptures some of the idealism that many people see as an important part of what the Beatles, and the sixties, were all about. So much of the "counterculture" was about challenging boundaries and expectations, searching for a new level of freedom. It's a complicated story how freedom and happiness can coexist with maturity and responsibility - nothing happens by accident. But let us say that we are not conventional performers; we're happy to earn a living doing this, but we don't measure our rewards with showtimes and ticket sales. Today in the airport, we could see people's reactions, as they would sing along, dance with their kids, and otherwise enjoy the music. We saw proof that Beatles songs are a great way for people to have fun. For us, the Beatles songs are just the vehicle, it's the fun that counts - the pure joy of music. I wish we had footage of people who stopped to enjoy the music with us today. Here's a photo of Dennis and me pretending to be guitar heroes during "Come Together." You'll have to take our word for it that people were singing along. It wasn't quite a flash mob, but it was a step in the right direction. We're after the heart of the experience, and flash mobs seem to be a great way to express that. We know plenty of music that makes people happy, so next time you have the impulse to participate in a flash mob, be sure to think of Beatles songs and let us know. We'll keep your secret until the time arrives that the surprise is revealed.